Another longer comic! Thought I’d do a smaller one, but nope. Such is Rasabi Cat. Expect to see more multi-rasabi-cats in the next comic. Maybe don’t expect that one next week though, we’ll have to see how non-rasabi-cat life and obligations play out! When I colored in the lady I literally just picked a couple random colors. By happy mistake I have made an old lady Skeletor. Myah! I will preface this by saying that Rasabi Cat was correct in saying that gaslighting is a terrible thing. If you are by chance unfamiliar with the concept, then enjoy a cursory introduction. I don’t intend for this comic to be anything other than a cartoon cat being undone by his own karma, but abuse and psychological disorders are always a touchy subject. So yeah. Still trundling along with my UX stuff. Last week was the end of the intro course and required copious amounts of work. This week is less copious, so therefore comic! Have you seen Everything? According to my incredibly in-depth analysis of Alan Watts, you have, for Everything was within you all along. We are the trees, and the bees, and the stop-motion-cartwheeling-camels. I have almost fully been transplanted into my new home. I expect to unfurl my foliage and blossom any minute now. This will hopefully mean more comic/project time, but it might also just attract bees and philosophy heavy voice overs. Either is fine. So I ended up moving. I didn’t think this would prevent me from creating a comic last week, but I was a fool. I’m posting this one from my wi-fi enabled table, having assumed my ISP would set up the internet when they initially stated would happen, a double fool am I. The comic is about the inevitable heat death of the universe but also breakfast foods. If you want a non breakfast foods, non semi-nihilist tale about entropy, I highly recommend Isaac Asimov’s “The Final Question.” It is short, easily consumable over the first meal of the day with your toppings of choice. Jobs! I have been extremely fortunate to be able to support myself with making silly shirts for these last three years, but as they say in all the famous quote books “that bulbous cat-cored ship is setting sail”. I just started a UX course which will probably lead to a UX obligation, a paid one, so the best sort. This won’t impact my production of comics as far as I know, but I’ll probably lean towards the shorter ones for a while yet. Full bulbous steam ahead. My spirit animal is my blender because it’s easier to hide from society how much peanut butter I eat in a smoothie. Also yes, here is Rasabi Cat in all his gritty origin story glory. I’m still figuring out exactly how I want to use this space. His adventures and wisdom dealings definitely won’t all be 8-10 panels, and I’ll probably revise old comics from time to time, but for now this is his home. Will I always capitalize cat when referring to Rasabi Cat? My creative writing minor says this is a detail to leave until the very pinnacle of the narrative, after it is far, far too late to turn back. Wikipedia explains self-anointing in animals more plainly than Rasabi Cat does, but Rasabi Cat could take Wikipedia apart on the sun-bleached Savannah, so there’s that. In part, self-anointing in animals is when they try and smell like the thing they want to murder or the thing they are avoiding being murdered by. This comic is dedicated to patches the dog, who decided that self-anointing herself with potatoes was necessary to her survival. When her life ended, potatoes did not play any part. Our family was also spared of any root vegetable related debacles. I have no choice but to conclude that Patches’ vigilance was responsible for our fortune. This story is also dedicated to a good friend’s cat, Cadbury. One evening Cadbury’s owner returned from a long night of pizza logistics, his reward a pizza of his very own. He opened the pizza box, perhaps so that Cadbury could enjoy the aroma, and left to get a soda. When he returned there was Cadbury, enjoying the aroma -with her entire body. She was picking at the peperoni, and sagely Cadbury knew that atop the pizza was the ideal place for such a task. Anyway. Hygiene is important because sometimes people have to smell you, and sometimes pizza must be hunted and destroyed. We are all strange loops. Pre-programmed complex machines. Everything we have done and will do is hard coded. So yes, I shall have another maple bar thx. 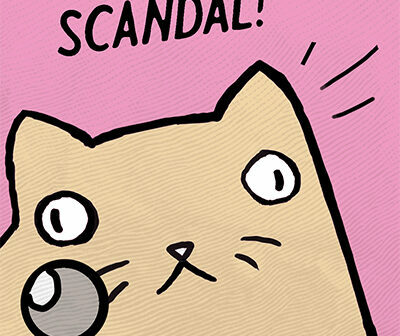 These are the first three comics of Rasabi Cat’s tragic adventures. I’ll hopefully do more, often if the internet decides it’s something they want to be subjected to. I have heard that rice doesn’t actually do anything and you should just let the thing dry out. I have also heard that rice is the best thing ever for all electronics. Either way, serving your water logged device in a bowl of rice celery is a last resort unless you are hungry then yes you might as well eat.